First Line: He was gorgeous and he was naked but, unfortunately, he was dead. When Wren Morgan showed up at the old Campbell mansion to begin cataloguing its contents for the upcoming auction, the last thing she thought she'd find was a dead body. When the body turns out to be a crook with ties to a recent jewel heist, it's time for Wren to meet private detective (and part-time bounty hunter) Death Bogart. Death and Wren hit it off-- partly because Wren knows the origin and pronunciation of his unusual name-- but neither one of them expected to be tossed right in the middle of a treasure hunt. Two of their fellow hunters will do anything to eliminate the competition, so survival means Wren and Death must buckle down and solve two mysteries that span a century and a half. This debut mystery kept me hooked from first page to last. The growing relationship between Wren and Death is excellent, and I love their sharp repartee. Wren is no shrinking violet-- her preferred choice of weapons is unusual to say the least-- and I like that. Death himself has got to overcome his reluctance in asking for help, and the auctioneering company that Wren works for-- Keystone and Sons-- has more than a touch of the Keystone Kops (for you old movie fans). Searching for both old treasure and new was a lot of fun, especially when it concerns looking for hidden rooms and secret passageways in an old house. 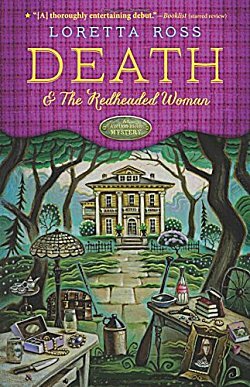 Speaking of fun, that is the overwhelming feeling I got as I read this book: that the author had so much fun as she was writing Death and the Redheaded Woman that she just had to share it with all her readers. It worked. Now I'm looking for book number two: Death and the Brewmaster's Widow! Just reserved it at the library! Thanks for the tip! This does sound like a good 'un, Cathy. The context sounds interesting, too. It is. It's originally what drew me to the book.